Full Briefing Book- This book contains background and supplementary materials. 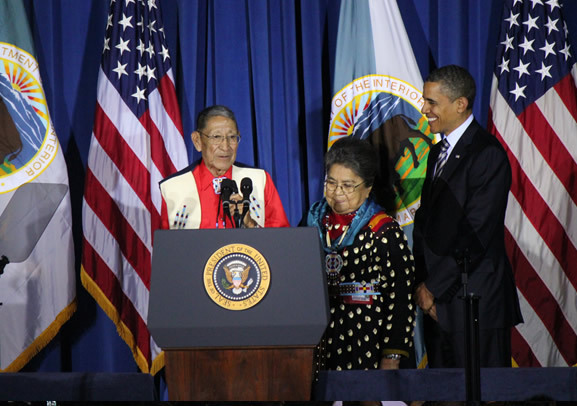 Photo Caption: Courtesy NCAI - Hartford "Sonny" and Mary Black Eagle of the Crow Nation close the White House Tribal Nations Conference with a prayer for "their adopted son," Barrack Obama. 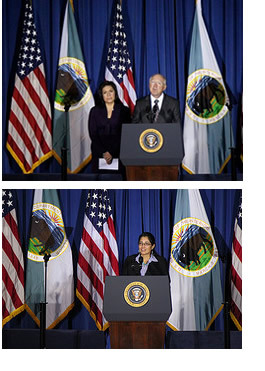 In the days leading up to 2011 White House Tribal Nations Conference, several important announcements were made that will have direct, positive impacts on the future of Indian Country. President Obama concluded the third White Tribal Nations Conference today with remarks focused on the future of Indian Country after recent gains and efforts made since the last meeting held in December of 2010. Obama highlighted a list of promises kept during the past year and also emphasized the need to keep pushing to bring change to Indian Country. "I told you I would bring tribal leaders to Washington...to develop an agenda that reflects your hopes and your concerns. And now, for a third year in a row, we have kept that promise. I told you that when I was President, we wouldn't just pay lip service to the idea of consultation. And today, we're holding every Cabinet agency responsible for working together with Indian tribes." Tribal leaders gathered at the Department of Interior at the end of week of meetings for a full day of dialogue at the White House Tribal Nations Conference with the Obama Administration and federal agencies (NCAI is preparing to send out comprehensive notes from the proceedings next week). This was the third White House Tribal Nations Conference. In the opening session this morning, Department of Interior Secretary Salazar, HHS Secretary Sebelius, HUD Secretary Donovan, and Deputy Director of the Office of Budget and Management Heather Higginbottom addressed the Conference attendees. (Watch video from the morning session. Remarks begin at 15:45 ). Tribal leaders met with agency and Administration officials for the remainder of the morning and the Administration reported out findings from the break-out sessions. (Watch the video from the afternoon report out). Promoting Safe and Strong Tribal Communities; Protecting Natural Resources and Respect for Cultural Rights; Improving Access to Healthcare, Education, Housing, Infrastructure and Other Federal Services; and Strengthening the Government-to-Government Relationship. "Secretary Duncan (and) Secretary Salazar, they're going to work together on this effort to prepare Native American youth to compete for the high-skilled, good jobs of tomorrow," said Obama in his remarks. "We're going to find ways to reduce the dropout rate. We're going to help students who've already dropped out re-enter the education system. And we're going to strengthen our Tribal Colleges and Universities. They are cornerstones of their community and they deserve our support." The announcement of the Initiative and Executive Order focuses on improving the educational situation of Native youth, comes just a day after the White House hosted young leaders from Indian Country as part of the "Champions of Change" program. "I want to give a shout-out to the young people who are here as part of the White House program called "Champions for Change." Really remarkable young people. I had a chance to meet them backstage," remarked Obama motioning to the youth in the audience. "There's Teressa Baldwin, who's working to prevent teen suicide among Alaska Natives. LeVon Thomas, who's bringing green jobs to the Navajo Nation. Dallas Duplessis, who started a gardening club to promote healthy eating in Tulalip, Washington. She wrote, "Our goal is not to be couch potatoes, but to grow some potatoes." I think Michelle would like that one." Through out his remarks the President sought to reaffirm his Administration's commitment to promoting a meaningful nation-to-nation relationship between tribes and the federal government with actions - not just words. "We're working to make our government-to-government relationship even stronger. We asked Congress to recognize the power of tribes to prosecute perpetrators of domestic violence, whether they're Indian or non-Indian. And in the wake of the Carcieri decision, we've asked Congress to restore the Secretary of the Interior's authority to take land into trust for federally recognized Indian tribes. So this new relationship represents a major step forward. It is change. But I promised even more than that. I told you that as President, I would work with you to tackle the most difficult problems facing Native American families. And that's exactly what we've done. We passed the Tribal Law and Order Act, and began making Indian Country a safer place to live. We permanently authorized the Indian Health Care Improvement Act, and made quality health care accessible to more Native Americans. Just this week, we streamlined leasing regulations, which will lead to more homes, more businesses, more renewable energy on the reservation. That's what change is. And finally, we said that even as we include Indian tribes in the broader promise of America, we're going to keep native traditions alive. So when Michelle launched Let's Move! in Indian Country, she brought lacrosse players to the White House, and invited Native American children to plant the "three sisters" crops in the White House vegetable garden. While our work together is far from over, today we can see what change looks like. It's the Native American-owned small business that's opening its doors, or a worker helping a school renovate. It's new roads and houses. It's wind turbines going up on tribal lands, and crime going down in tribal communities. That's what change looks like." The Executive Order on education was signed by President Obama prior to addressing the Tribal Nations Conference. The President remarked, "even as we meet at this moment, we have to prepare the next generation for the future that's why this morning, I signed an Executive Order on American Indian and Alaska Native Education and Tribal Colleges and Universities." The Executive Order supports activities to strengthen the educational opportunities and improve the education outcomes for all American Indian and Alaska Native students, including opportunities to learn their Native languages, cultures, and histories and receive a complete and competitive education that prepares them for college and a career and productive and satisfying lives. Furthermore, this executive order establishes a White House Initiative on American Indian and Alaska Native Education, fulfilling a long standing tribal request by directing the Secretary of Education to appoint an Executive Director to serve as the Secretary's senior policy advisor on all federal policies affecting Indian education. Pursuant to the Cobell Settlement, Secretary of Interior Salazar has established an Indian Trust Reform Commission to undertake a comprehensive evaluation of Interior's trust management. Yesterday, the Secretary named the five members of the Commission: President Fawn Sharp, Quinault Nation, Dr. Peterson Zah, former President of the Navajo Nation, Stacy Leeds, Cherokee and Dean of the University of Arkansas School of Law; Chairman Tex G. Hall, Three Affiliated Tribes and past President of the National Congress of American Indians, and Bob Anderson, Bois Forte and Professor of Law at the University of Washington. In a press release on Thursday, Secretary of the Interior Salazar and Assistant Secretary-Indian Affairs Echo Hawk announced a Tribal Consultation Policy for the Department of the Interior, launching a new era of enhanced communication with American Indian and Alaska Native tribes. The new policy emphasizes trust, respect and shared responsibility in providing tribal governments an expanded role in informing federal policy that impacts Indian Country. In a press release on Monday, Secretary of the Interior Salazar and Assistant Secretary of Indian Affairs Echo Hawk announced new regulations for approval of federal surface leases. The new regulations create a track for residential leases and a track for commercial and industrial leases as well as altogether remove the need for BIA approval of short term leases for events like parades. By establishing time limits for BIA approval, this comprehensive reform may remove some of the barriers to tribal renewable energy development as well as other economic development in Indian Country. The 60 day public comment period is now open. For a Q & A document on the proposed rule, click HERE. For a comparison of existing and proposed regulations, click HERE. For the proposed rule, click HERE. Section 221 of the Tribal Law & Order Act (TLOA) makes a significant amendment to PL 83-280 ("PL 280") to allow tribal governments in the PL 280 states to request that the federal government exercise concurrent jurisdiction over reservation crimes, with consent from the Attorney General. The purpose of this change is to address long standing concerns that some states and local governments have not fully addressed reservation crime under PL 280. Last year, the Department of Justice (DOJ) decided to implement this provision through federal regulations. Those regulations have since been drafted, consulted upon, and finalized, and they were signed by Attorney General Eric Holder earlier this week. They are expected to be published in the Federal Register any day now and will be available online at the Tribal Law & Order Resource Center website as soon as they become available:www.ncai.org/tloa. On Wednesday, Senate Judiciary Committee Chairman Patrick Leahy (D-Vermont) and Senator Mike Crapo (R-Idaho) introduced S.1925, bipartisan legislation to reauthorize the Violence Against Women Act (VAWA). This new version of VAWA contains several of the same proposals that are contained in S.1763, the Stand Against Violence and Empower Native Women Act, which Senator Akaka (D-HI) introduced in October. Both bills contain several tribal-specific proposals that would strengthen tribal sovereignty and greatly enhance the safety of Native women. On Friday morning, FEMA Director Craig Fugate announced that FEMA and the administration are looking to support amendments to the Stafford Act that would allow tribal governments to apply for a disaster declaration from the President. At present, only a state governor can request a declaration and a tribal government has to seek the approval of a governor. This flaw in the Stafford Act creates an unnecessary loss of valuable response time in seeking federal assistance. More details are to be released next week. The Internal Revenue Service (IRS) and the United States Department of Treasury (Treasury) continue to increase their dialogue with tribal nations. During this past week, the IRS and Treasury held a consultation listening session regarding the IRS' taxation of benefits and programs offered to tribal citizens by their tribal governments. Also, both IRS and Treasury are currently seeking comments from tribes regarding the reallocation of Tribal Economic Development (TED) Bond funds. TED Bonds were authorized under the American Recovery and Reinvestment Act (ARRA) and have largely remained underutilized due to a variety of factors, including the national economic climate, which has been dismal for the overall bond market. Both of these issues are key initiatives within NCAI's tax policy initiative. The Department of Justice (DOJ) will host a consultation next week to obtain tribal input on the Prevent All Cigarette Trafficking (PACT) Act on December 14, 2011, at the DOJ Building (950 Pennsylvania Avenue, NW), beginning at 1:30 p.m. The PACT Act, as recently interpreted by federal officials, presents deep concerns for tribal leaders and entrepreneurs involved in the commerce of tobacco products. DOJ, in an effort to work with tribes in ensuring respect for tribal sovereignty, is contemplating revising current guidance on several issues, which have negatively affected tribal tobacco sales and distribution. This issue is also included within NCAI's tax policy initiative and has far-reaching implications to economic development in Indian Country. On Thursday, the U.S. Transportation Secretary Ray LaHood announced that $15 million will be provided to help American Indian and Alaska Native tribal governments invest in public transit to help improve access to employment centers and promote economic development on tribal lands. "With unemployment among American Indians at an unacceptably high rate, reliable public transportation offers a vital link to jobs, training centers and other essential services," Secretary LaHood said. "The Obama Administration is committed to working with leaders in Indian country to improve transportation connections while boosting economic conditions and creating jobs in tribal communities." Click here to view the press release.